John Stones will reap the long-term benefits of playing in a number of different positions for Manchester City, according to Pep Guardiola. The England international filled in at right-back in the absence of the injured Kyle Walker as City demolished Burnley 5-0 in the Premier League on Saturday. Stones has also been deployed in midfield at times for City this season as Guardiola tests the 24-year-old's capabilities in a range of positions. 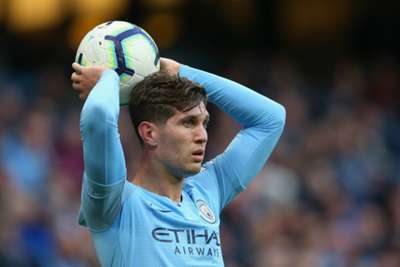 And the City boss is hopeful Stones can thrive by offering cover across defence and in the middle of the park, as well as in his most natural role at centre-back. "He can't play winger, attacking midfielder or striker – no way," Guardiola told reporters. "I think it's good for the young players like John Stones that they learn to play in different positions. "It helps him become more intelligent, to understand the game more and he has more chances to play regularly because the manager needs him in other positions. He can play three in the back, in a four too, but I think he can play holding midfielder because we only have Fernandinho. "He can play different positions and that is good for him. He has a long career in front of him." On Walker's injury, which developed during the international break, Guardiola added: "I think he complained there that he was not feeling quite good. "That is what he said to us when he came back, why he wasn't comfortable and not ready against Burnley. He only played 10-15 minutes in Spain but they told me in that period he didn't feel so good. "Hopefully he can come back Tuesday for the game against Shakhtar Donetsk [in the Champions League], but he came back from the national team with a problem in part of his adductor and groin and some problems there and we didn't want to take a risk." City are top of the Premier League but are yet to show their best form in Europe, losing at home to Lyon and requiring a late winner from David Silva to complete a comeback away to Hoffenheim. But the resounding triumph over Burnley, secured thanks to goals from Sergio Aguero, Bernardo Silva, Fernandinho, Riyad Mahrez and Leroy Sane, was the ideal preparation for Tuesday's Champions League trip. "The clean sheet is so important but the most important is how many chances we concede," Guardiola continued. "Anfield it was almost one, today [Saturday] we didn't concede a shot on target. They had one clear chance but after that we were solid. You can't win games if you're not solid. "We create on average 20 shots every game. That's pretty good given we got 100 points and people couldn't believe how good we were [last season]. We're just nine games in but this is the way we want to keep going. "The Champions League is a different competition – we dropped three points. Every game is a final and we are going to play Donetsk like a final."